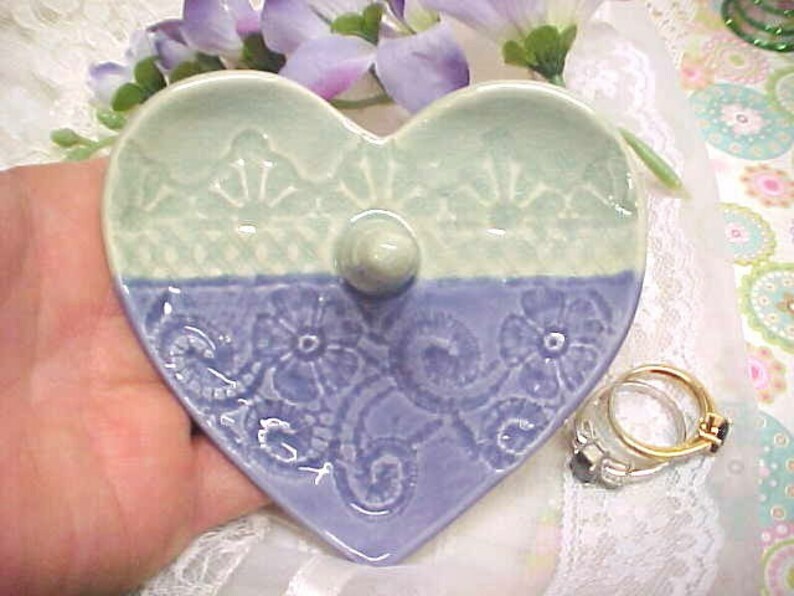 I made this Heart Shaped Wedding Ring Dish from Porcelain clay & impressed a gorgeous Floral piece of lace. It is glazed in Purple Haze & Celadon Crackle. When you need a lovely Gift that's Ready to Mail, this dish will make a cherished Bridal, Engagement Gift, Wedding, Anniversary or Birthday gift! This handmade pottery dish is very special! It will be great as a Ring Bearer pillow alternative & Keepsake dish! NOTICE SIZE: Measures about 4 inches wide, about 4 inches from top to bottom. Post is about 2 inches tall. I put Cork pads on bottom of the dish. Visit my shop for more lovely pottery items!